On Sunday May 6, the students of Taste International gather their collective knowledge from this 14-week program and create a 5-course meal. Taking into consideration the fundamental aspects of the program, like culture and nutrition, as well as components more specific to professional cuisine, such as plating, course design, texture, and palate, these students will design and create a meal that will take you on a journey around the world. The first week of May will mark the completion of the Taste International pilot program with partner, Mt. Baker Community Club with select students from Franklin High School. Through fantastic sponsorships with Sur La Table, Group Health and Urban Enoteca, these students will have gone on field trips to farms and kitchens throughout Seattle and taken classes from guest chefs, learning the ins and outs of the kitchen all the while exploring the richness of food from around the world. The event will take place at Urban Enoteca, in one of their fantastic event spaces, the Riddling Room. As part of their sponsorship, Urban Enoteca has given the students the use of their professional kitchen to create their 5-course feast. Alongside the creation for this dinner, the students will have the help from Urban Enoteca's cooking staff and Executive Chef, Chris Opsata, to guide them through the process of putting together a multi-course dinner. With years of experience creating seasonal, farm to table inspired cooking, Chris uses every aspect of food as his canvas, and will demonstrate to the students the truest nature of creativity in the kitchen! As one of our basic needs, Chris strives to elevate food in a way that inspires and evokes emotions of community, friends & family, cultural pride and whimsy. With a strong emphasis on local ingredients, Chris and Urban Enoteca believe that cooking is only as good as the raw ingredients you are given access to. This program is a 14 week pilot, with the hopes of integration into all public high schools in SE Seattle. 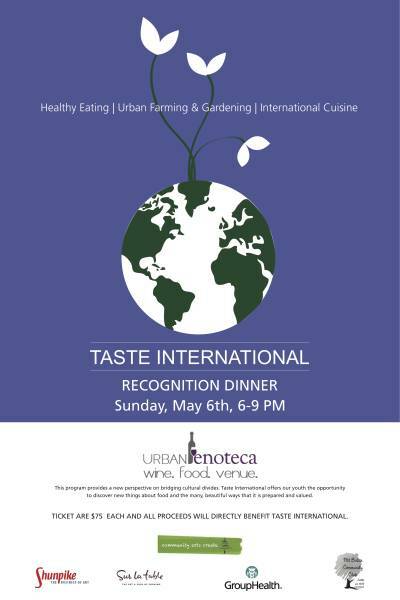 All proceeds from this event go directly to Taste International. For more information on Taste International, please visit our website and blog.